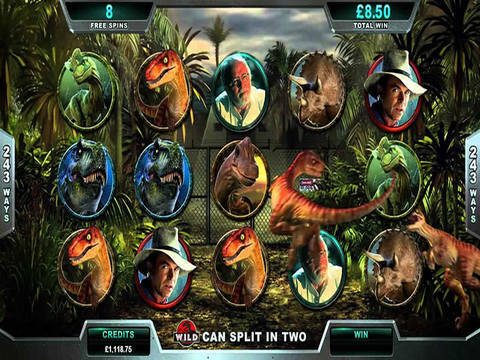 Based on the books and movies of the same name, the Jurassic Park slot machine is looking like it could be one of Microgaming's biggest releases of the year. If you want to try it out for yourself, the Jurassic Park free play slot is also available here, and players in Canada are sure to fall in love with this title since there's no registration and no download required to try it out. As you might suspect, this game is all about the dinosaurs that were brought back to life thanks to preserved DNA in hardened amber, and they are ready to go on a rampage to help you get some big payouts. There are a lot of different types of dinosaurs that have been discovered, and the Jurassic Park online slot plays on this with some great features. This game uses the popular 243-ways format, and there are five different free spins bonus rounds where you'll get 12 free turns with a different added feature. The dilophosaurus gives you winning wilds, the brachiosaurus grants a mystery multiplier, the triceratops gives you running wilds, the velociraptor gives you wilds that split and wilds that give you multipliers on your wins, and finally you have the tyrannosaurus rex which will turn entire reels wild. You can check out details on these features in the Jurassic Park demo. These aren't the only extras in this feature-packed game. You'll also be able to pick up extra stacked wilds which give you better chances for those awesome multi-line wins on a single spin. On top of that, the T-Rex Alert feature adds 35 more wild symbols to the reels than usual, and this is one of the most exciting parts of this review because no other games do this yet. As you can probably guess, this is a massive addition of value to the game no matter if you play the traditional software, the no download version or the mobile version of the Microgaming software. If you're looking to get in on the action with this new game, then Royal Vegas Casino is the place to be. If you're familiar with the Dark Knight Rises slot, then you'll probably already have a good idea of what some of the gameplay is going to be like in Jurassic Park. They are both named after huge movies that did very well in theaters, but they also have similarities in that they use the 243-ways format and the main feature is based around free spins with extras that are activated just for the bonus round. Royal Vegas Casino has both of these games since they are powered by the Microgaming software, and they have tons of free spins and no deposit bonus opportunities available on a regular basis that can get you in on the action in Jurassic Park right away.